Fishing with Boards for covering a 600 foot wide path while trolling bucktail streamer fishing flies. Fishing tips From the Pro's showing you all the advantages of Boards with flies and lures. 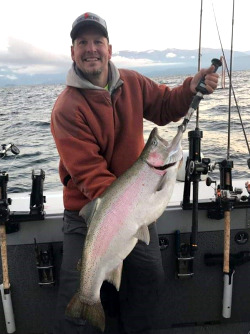 Pend Oreille 2018 Derby Winner - Moose Zema from Colville WA boated this beauty on a Frisky Jenny Stormin Mary Glow Fly! Join Frisky Jenny's Hot List and stay on top of all the new Big Fish photo's, sales and tips. Big Fish Caught on a Frisky Jenny Fly! Welcome to the Frisky Jenny Fly Company. A family owned business which began in Coeur d' Alene, Idaho in 1985, we have grown to offer not only high quality bucktail streamer flies, but one of the top performing planer boards on the market today. The fish catching reputation of the Frisky Jenny products has spread into Washington, Montana, and southern B.C. We have decided to expand and offer these products to you. Give them a try. You will be glad you did.